Let's talk about milk. And not the kind you buy at Walmart. A few of the joys of motherhood include learning to breastfeed, learning to pump, and just learning a whole heck of a lot about your body - maybe more than you wanted to know. Breastfeeding is a phenomenon that just baffles my mind. It's cool, weird, sweet, gross, precious, and annoying all at the same time. And then once you've figured out how to get milk, you've got to figure out how to keep it. So, let's talk breast milk, ladies. You can store it in the fridge or in the freezer. For me, if the milk is in the fridge, it's in a bottle. When I store it in the freezer, I use the Medela Pump and Save storage bags. Regardless of how you store it, you should always write the date it was pumped on the bottle, bag, etc. We keep masking tape and a sharpie in the kitchen for when we needed to write dates on bottles. And if you happen to be combining two bottles of milk from the fridge that were pumped on different dates, write the oldest date on the bottle of combined milk. You can read online and find a huge range of answers to this question. Being told my frozen milk will be good anywhere from 3 months to 12 months is not comforting. That's a huge amount of time! We're all different so what's true for me may or may not be true for you. So far, I haven't experienced milk going bad in the freezer. I think the longest I've kept it frozen before feeding it is around 4 months. If you pump into a bottle and stick it in the fridge, that's another thing. There are also many answers to how long breast milk can stay in the fridge. I've heard 24 hours and I've heard a week. Again, very confusing. For me, if I put it in the fridge, that means I'm planning to use it in the next 2 days. If I'm not going to use it in that time frame, I just freeze it. I'd rather be safe than sorry. As far as leaving breast milk out at room temperature, I've heard 4 hours is a safe amount of time. Can you add cold milk to warm milk? I read somewhere that you shouldn't combine freshly pumped breast milk with cold breast milk. Whether or not it's true, I've always abided by that rule. So, if you're combining a warm bottle of milk with a frozen bag of milk, turn the frozen bag into warm liquid and then combine them. 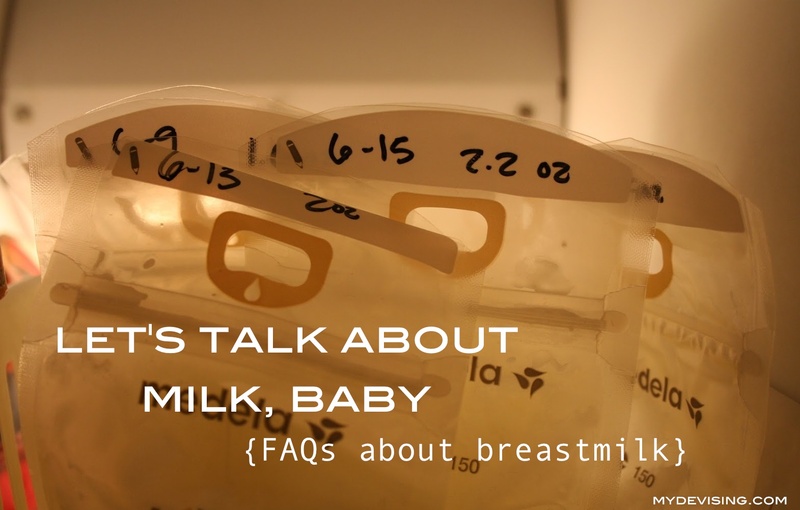 How should you warm and prepare breast milk? To warm a bottle of breast milk from the fridge, first you need to shake it. The fat will stick to the sides of the bottle sometimes. (Appetizing, I know.) Stick the bottle in a bowl of warm water or run warm water over the bottle. We actually do a combination of both. Colt has his own little system of putting the bottle in a bowl directly under the faucet. The warm water comes down and turns the bottle in the bowl, warming it equally. To warm a frozen storage bag of milk, you can pretty much do it the same way. Stick the bag in a bowl of warm water and let it turn to liquid. And remember, you're trying to get the milk warm, not hot. How do you know when your milk is bad? The easy way is to smell it. If it smells sour, it might be bad. However, it's also possible that it could smell sour but not be bad. So what do you do then? Taste it. Oh yes. If it's not sweet and it tastes sour, it's bad. And ... I think that's it. I was talking to a friend the other day and I was saying how I'm sure there are moms out there thinking, I have three kids and this girl has one. She hardly knows what she's doing! And, yes, you would be right. I have no idea what I'm doing. However, that's what why I'm posting all of this information while I'm still a new mom. If I waited until later, I'd forget what it was like to be utterly confused and I'd forget what was important to mention. So, while I do realize that I have one kid and he's not even 8 months old yet, I'm trying to provide a perspective that maybe some other moms can relate to. Let me know if you can think of any other questions or other tips to add on this topic.